1. What Are the Regulations for 120-Month IRA CDs? 3. 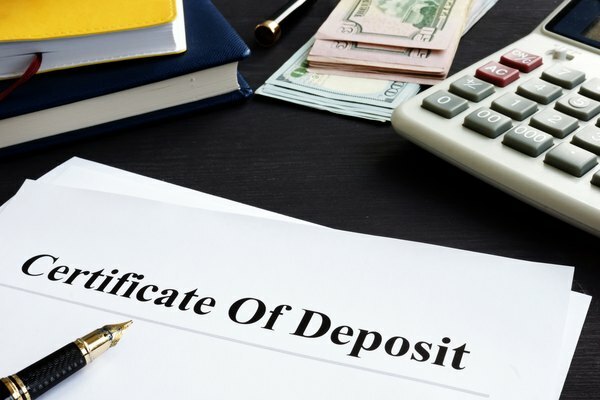 How do I Calculate Yearly Deposit Amounts Based on the Total Amount of a Certificate of Deposit? A certificate of deposit, or CD, is one of the most popular and well-established assets for modern investors today. Featuring a fixed maturity date and interest rate, CDs offer a high degree of security and act as a stable hedge for many investors who are simultaneously pursuing more high-risk assets. The specific rate of return for a CD will depend primarily on the rate of interest attached to it at the time of issuance. Combining this information with the maturity date of the CD should give you a clear idea of the specific amount of financial return the CD will provide over its lifetime. The return on a certificate of deposit is primarily influenced by the interest rate attached to it and its maturity date. These two factors will directly determine how much return the CD offers throughout its maturity. A CD is issued by a bank rather than a company or the federal government. That being said, CDs are typically insured by the Federal Deposit Insurance Corporation up to a value of $250,000. With that in mind, CDs are widely considered to be one of the safest investment vehicles open to individuals today. When a CD is issued, an interest rate and maturity length are attached to it. Individuals purchasing the CD cannot legally access the funds in it until the maturity date has been reached. In exchange for this commitment, the CD will accrue interest annually at the rate specified during issuance. A CD can be interpreted as a promissory note issued by a bank to an investor. As a general rule, the longer you allow the bank to hold on to your funds prior to repaying you through the CD, the better interest rate you can expect on your investment. It could be stated that there is a direct relationship between CD term length and overall yield. For example, it is common for a CD with a maturity length of five years to feature an interest rate of 3 percent. This would be considered a relatively high interest rate for a CD. In fact, the vast majority of CDs will feature an interest rate under 3.25 percent. Compared to other similar investment platforms, such as savings accounts, CDs appear to be an attractive investment vehicle. Given the fact that an interest rate of 1.9 percent on a savings account would be considered extremely high, a CD is by far a superior investment strictly in terms of yield. That being said, there are specific caveats attached to these rates of return, the most important being the fact that withdrawing funds from a CD prior to maturity cannot be done without being forced to pay early withdrawal penalties. Although a savings account may feature a lower rate of return, they also usually allow account holders to withdraw funds as often as needed, making them significantly more flexible than CDs. For those who are interested in investing their funds in a CD, a variety of options are available. In fact, investors can choose from up to five different forms of CDs when planning their long-term investments. The specific options available include bump-up CDs, step-up CDs, no penalty/low penalty early withdrawal CDs, jumbo CDs and IRA CDs. Bump-up CDs: These allow investors to request an increase in their yearly interest rate in situations where banks increase their annual percentage yield, or APY, after the CD has been purchased. Although these CDs may carry with them minimum deposit requirements, they also offer an additional degree of flexibility for certificate holders. Step-up CDs: They also feature fluctuating rate adjustments, although in this particular scenario the rate increases will occur in a regular fashion over the length of maturity. After purchasing the CD, the investor will be given detailed information that explains how interest rates on the CD will be hiked periodically over the length of the asset. No penalty/low penalty early withdrawal CDs: These may be the ideal option for individuals who have volatility in their own finances and may require access to their CD funds prior to maturation date. Although this particular variation on the CD reduces the penalty for early withdrawals, they also often feature reduced interest rates. Jumbo CDs: They often higher return rates in exchange for larger deposits (they typically require a minimum deposit of $100,000 or more). IRA CDs: These may be the optimal solution for those who are interested in pairing their CD investments with their retirement plans. These CDs place the invested funds into an individual retirement account rather than simply holding them as an independent CD. Generally speaking, a CD's maturity length can last anywhere from three months up to five years. As mentioned previously, CDs with longer maturity rates will almost always feature a higher interest rate and, consequently, return on investment. That being said, certain scenarios may make it worthwhile to select a shorter maturity length for your investment. For example, if you suspect that interest rates will be rising over the short term, it may be in your best interest to purchase a CD with a shorter interest rate to secure small gains in coming months while simultaneously waiting to see if interest rates increase to the point where a CD with a longer maturity length would be strategically advantageous. In the event that you are purchasing a CD with a maturity length of less than one year, make sure that you properly adjust the APY to match this duration. For example, if you have invested in a CD with a maturity length of six months, an APY of 0.8 percent will not directly reflect the amount of return you will receive given the fact that you are holding the asset for less than a year. However, a simple mathematical calculation will reveal that an APY of 0.8 percent can be divided in half to reflect a maturity length of six months, or one-half of a year. With this in mind, it is always important to ensure that you are properly tweaking the given APY on your CD to match the maturity length you have locked in during your purchase. Experienced traders can create a CD ladder in order to take advantage of both long- and short-term CDs as well as the fluctuations in interest rates that commonly occur. Simply defined, creating a CD ladder involves dividing your initial investment amount into a set of equal parts, each of which is invested in a different CD featuring its own unique maturity length and interest rate. As each CD reaches its maturity date, the funds accrued are then reinvested in a CD with a five year maturity length. Once the ladder has been completed, investors are left with a series of five year CDs, each of which matures at a different point of time and features the highest possible interest rate at the moment of purchase. As mentioned previously, CDs are offered by banks as well as credit unions. Virtually all of the major banking institutions in the United States offer some form of CD to investors, although specific variations between their policies do exist. In some situations, you may also be able to find CDs for sale through online brokerages, although this is far less common than via traditional banks.With that in mind, your best strategy for purchasing a CD is to first research the interest rates and maturity lengths being offered by various banks, and then select a product that matches your own needs and investment preferences. Specific websites such as Bankrate and NerdWallet provide a comprehensive overview of current CD rates, which can be sorted by bank, ZIP code and maturity length. These websites are updated regularly to provide readers with the most recent information relating to CD and other investment platforms. Given the fact that rates for CDs can fluctuate significantly, this information is absolutely critical when it comes time to make an informed decision about your investment. Once your CD has reached its maturity length, you can redeem it for cash relatively easily. Make sure you have a copy of the time deposit agreement attached to the CD, as well as a valid photo ID handy. At this point, you can return to the bank from which you purchased the CD and begin the redemption process. Typically, an account manager at the bank will review your documents and then "close" the CD. At this point, you can specify where and how you would like your funds distributed or transferred. Keep in mind that you only have a brief window of time to redeem your CD before the terms are refreshed and a new maturation period begins. This window is referred to as the grace period. If you do not redeem your CD during the stated grace period, you will be forced to wait until the new maturity date is reached or be forced to pay an early withdrawal penalty. As always, you should take the time to consult with an investment adviser or other financial professional before purchasing CDs if you have any questions about this process or these items. Given the penalties associated with early withdrawals, CDs often represent a long-term investment that should only be acquired once full knowledge of the process and the potential risks and rewards are identified. If possible, use a CD calculator to project the total payout from your investment at various maturity lengths in order to determine whether or not investing in a CD matches your own specific short-term and long-term goals. If it does not, a different investment platform might be better suited to you. Remember that a wide array of CDs are available for purchase. Even though a specific bank may offer competitive terms with regards to interest rates and maturity lengths, you should not be tempted to purchase a particular variant of a CD only because of these parameters. For example, if you require additional flexibility in your investments, make sure you locate a low penalty early withdrawal CD rather than simply settling for a long-term CD. This will help ensure that you remain in control of your finances throughout the length of the investment and do not have to pay for early withdrawal fees that could have been avoided otherwise. NerdWallet: What Is a CD (Certificate of Deposit)? Bankrate: Which Certificate of Deposit (CD) Account Is Best for You? What Is Pushing a Bond Yield Higher? How Much Interest Does an Investor Get on Stocks? Does Interest on a Certificate of Deposit Get Reported on a 1040?